The world's largest scientific articles store. 20,000,000+ articles for free. ^ 1.0 1.1 Quirin Schiermeier. Pirate research-paper sites play hide-and-seek with publishers. 《自然》. 2015年12月24日 [2016年3月9日]. ^ Darlene Storm. Jump paywalls, score academic research for free, share it without being busted. 《计算机世界》. 2015年8月19日 [2016年3月9日]. ^ 3.0 3.1 Mary-Ann Russon. Sci-Hub: Russian neuroscientist running 'Pirate Bay for scientists' with 48 million free academic papers. 《国际财经时报》. 2016年2月15日 [2016年3月9日]. ^ Ernesto Van der Sar. SCI-HUB, BOOKFI AND LIBGEN RESURFACE AFTER BEING SHUT DOWN.TorrentFreak. 2015年11月21日 [2016年3月9日]. ^ Simon Oxenham. Meet the Robin Hood of Science. 大构思. 2016年2月10日 [2016年3月9日]. ^ 6.0 6.1 Adam G. Dunn、Enrico Coiera和Kenneth D. Mandl. Is Biblioleaks inevitable?. 《医学互联网》. 2014年4月22日, 第16卷 (第4期): E112页. doi:10.2196/jmir.3331. PMID 24755534. ^ Ernesto Van der Sar. 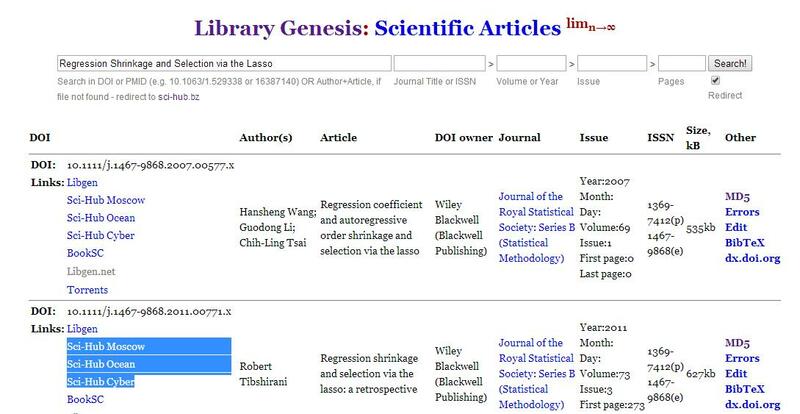 Elsevier Cracks Down on Pirated Scientific Articles. TorrentFreak. 2016年6月9日 [2016年3月9日]. ^ Alexandra A. Elbakyan. Lifeboat Foundation. [2016年3月9日]. ^ Ernesto Van der Sar. SCI-HUB TEARS DOWN ACADEMIA’S “ILLEGAL” COPYRIGHT PAYWALLS.TorrentFreak. 2015年6月27日 [2016年3月9日]. ^ Lucas Brouwers. Gratis wetenschap via Kazachstan. 《新鹿特丹商业报》. 2016年2月3日[2016年3月9日]. ^ Guillaume Cabanac. Bibliogifts in LibGen? A study of a text-sharing platform driven by biblioleaks and crowdsourcing (PDF). 《资讯科学暨科技学会期刊》. 2015年3月27日.doi:10.1002/asi.23445.